We woke up again to the usual ugly weather, blowing snow and crazy wind – nasty nasty nasty. But first a word about last night – I think in all the weather, the drift, the arctic ‘treadmill’ as it is called made life a bit miserable – so we had a treat. Keith had reconstituted dried apples, I caramelized them, et voila – quesidillas became crepes a la Ross (no a la mode – though we could have reached outside the tent and added plenty of snow). Then came the Baileys (Dale) and Laphroig (Keith) – all in all we went to bed feeling pretty satisfied. 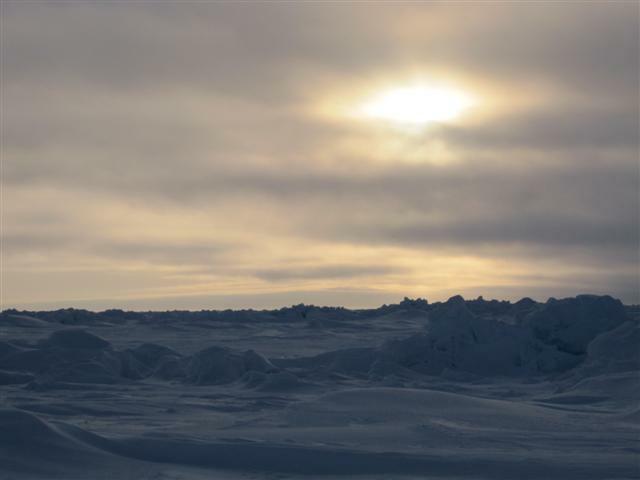 The other group that went out at the same time as us is somewhere near us but we can’t see them – apparently 2 of their team left the ice by chopper yesterday – we don’t have details but hope they are well. Also lots of open water – which leads me to the next challenge – apparently my horoscope today says something along the lines of relax by the water – well I had other plans – I didn’t quite swim – but I came close – there was a small tilted pan of ice, some slush and unfortunately I caught a tip and down I went – left leg in up to thigh – Dale was behind me and was about to rescue me (what else is new?!) when I told him to stop as I wasn’t sure if the pan would hold me, my sled and Dale as well. I tried to find purchase and put my left arm in to above the elbow. Slowly I was able to extricate myself – and all I could think of was thank God we did the dip in Ely or I would probably have panicked instead of just taking my time. 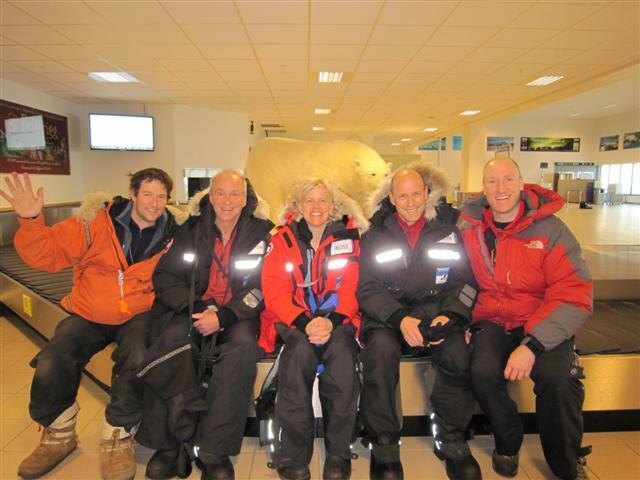 Got the full slushy – lots of water in my boot – Keith (Captain Keith) said keep going – we had to get off the pan. about 5 minutes later we stopped and the team went to work. 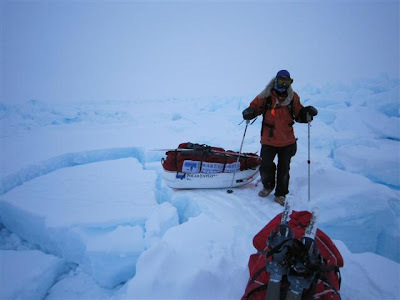 Keith found my spare liner and sock, Dirk took my boot and sock off, Michel gave me warm drink – they rubbed my foot to life, redressed the sock and spare liner and away we went – best way to stay warm is to keep moving! Now we are in the tent and I am just fine!! Michel provided the biggest moment of humor today – there was about an 8 foot drop off into powder and he decided to do a ski jump launch – but face planted instead – I thought Keith was going to wet himself he was laughing so hard. Finally a bit of magic about 1 hour from camp – the sun came out – we could finally see the landscape – gorgeous, somehow like the moon, shadow, sunlight low on the horizon – everyone much happier for it. Dale has coined the best expression so far of the trip – day in day out like taking a hammer to your head, get up the next day and HIT yourself again! Whose idea was this trip anyway? Perhaps tomorrow could be dull???? We have skiied 44.8 nautical miles over the ground to date. Today was a day of water and wind. We came across many many breaks, small ones, slushy ones, lake like ones. Keith was amazing at finding paths around, over, through which made for some interesting moments! We crossed 89.1 again today – it is ‘groundhog day’ (remember the old movie…..) – we go to sleep, we drift, we wake up still behind 89.1 and we ski all day – losing 0.2 to the treadmill each hour – so we have skied 39 miles, 29 hours and lost 0.2 about for every hour – hence our total ski is 44.8 nautical miles. 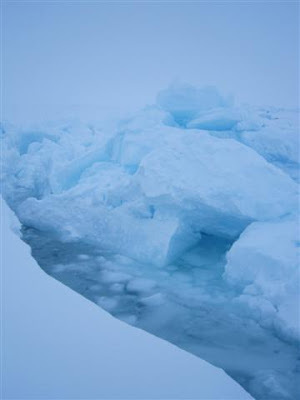 Yet we were closer to the pole 48 hours ago……and are still 46 miles away. Keith had a great kite which we flew in camp. Winds gusting to 20 mph again which made for amazing kite flying. Spirits remain high despite the challenging conditions. Take extreme weather and harsh condtions – put them in a blender and you have today in a nutshell. We opted to go out at 4 pm as we thought things had settled down. 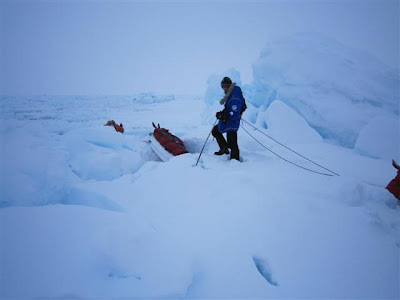 About 1 hour in we came across open water, a lead, that was about 8m wide. Huge sections of slush, all I could think was add lemon, rum and an umbrella and away we go. It took us about 45 minutes to try to find a way around it – but we did eventually – moving quickly. Again zero visibility in sections. The plan was to pull until midnight. 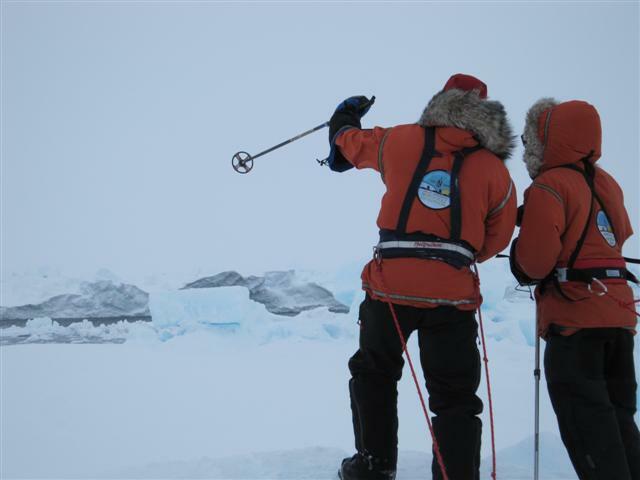 Then around 6 the wind really picked up – I mean howling – we pushed on for another 2 hours and then called it. 8pm we started to set camp – wind was about 30 mph gusting much more. All hands on to put each tent up in turn – I was hanging on to the strings and all I could think is wow I’m going to fly. We are now in tent and eating beef stew. 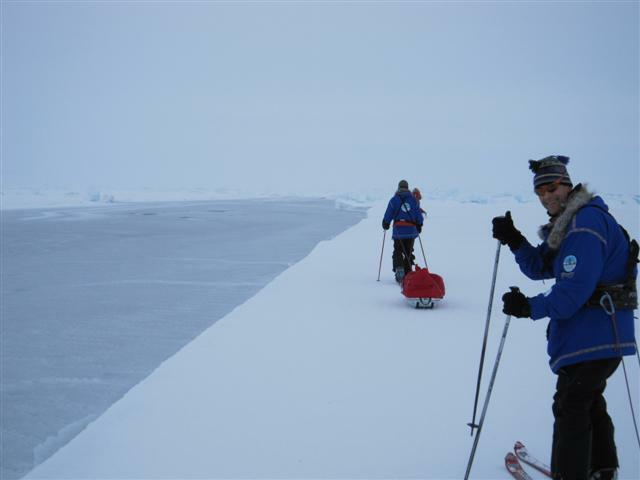 We have actually skied 29.5 miles which still doesn’t account for drift when we are skiing. 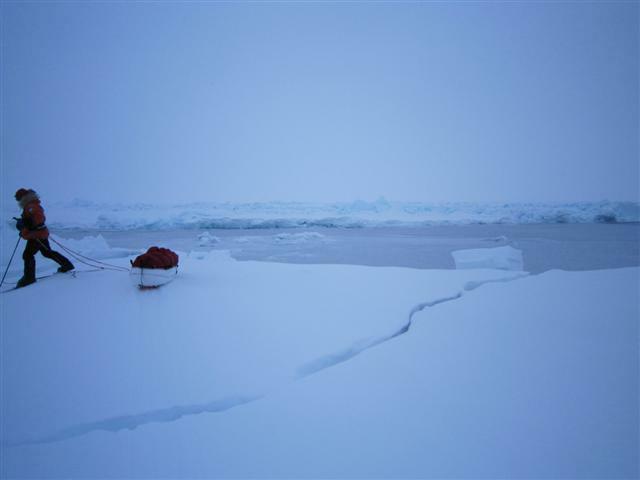 However tonight we are further from the pole than we were two nights ago – the drift is amazing. Our location is: 89.10.665; 134.32 – i.e. we have skiied 29.5 miles but accomplished just over 10! It Certainly Is An Adventure! 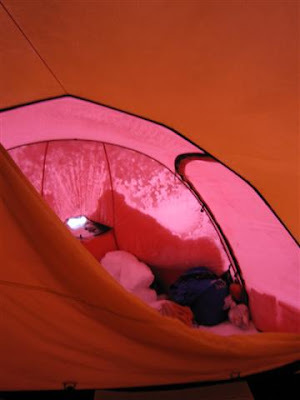 there has been drifting snow that has buried all of our sleds, skiis and started to bury the tent. p.s. Can’t thank everyone enough for the comments – they bring warmth and humour to us everynight as we do the dinner prep!! Voicemail from the Top of the World! Location – latitude 89.15.736 (i.e. 45 miles to go). Lost 2.1 nautical miles during sleep due to drift. Ugh. The wind was from the northwest – so we continued to lose ground as we walked along, reminding me of a gerbel on a spinning wheel. 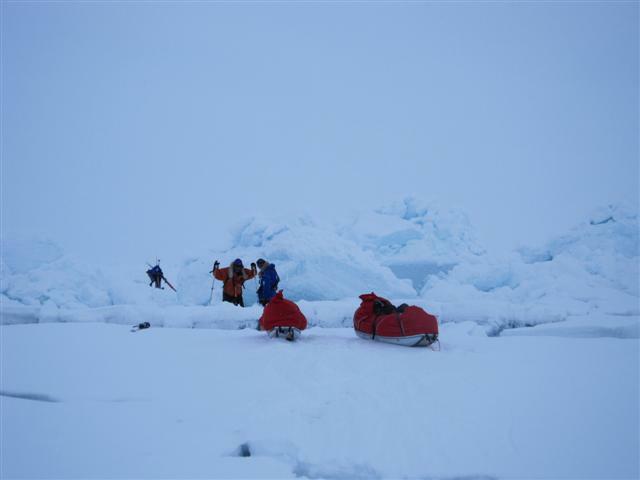 The gusts were so strong that at times the sleds would run to the side of us. My goggles on the left side were completely frosted over due to wind and snow. 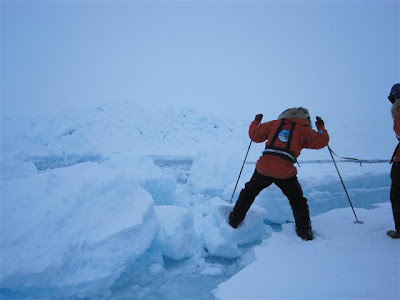 There were not as many obstacles today so we covered – 8 nautical miles. 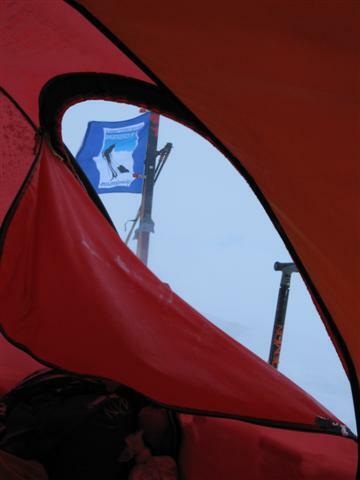 We set camp amidst the crazy wind – a bit like flying a kite – something we will do on a better weather day. Dale is doing great. Keith and Dirk are machines. Michel is providing the humor. For dinner tonight is Pasta Primavera with chicken, appetizer is quesadilla with cheese – the menu has been brilliant. I have been doing the breakfast short order style – this morning we had bagels, bacon and cheese. 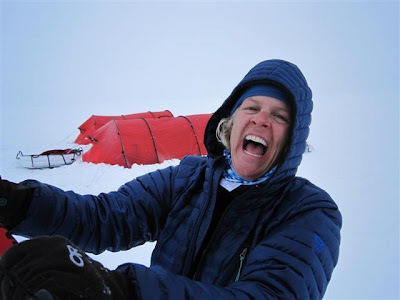 We are getting better at setting up camp, though the weather adds its challenges, it makes it that more important to get the tent up and get out of the craziness out there. Plane ride in was amazing – about 2.5 hours smooth ride – Had a chat with the pilots – great – let me sit up in the cockpit for a while – great view. Landed and had about 1.5 hours at Barneo – great soup, coffee and cookies – the best was the porta potty with sign reading next toilet 1500 km!! 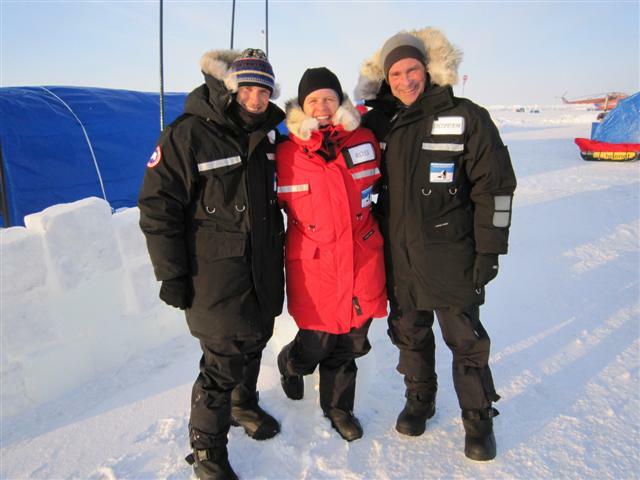 Then we boarded the helicopter and took off to our starting point. 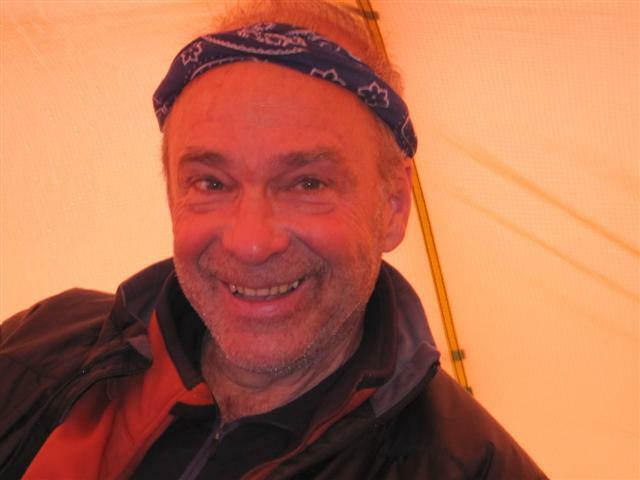 landed at 89 on the nose – and all of a suddden we were completely alone – the helicopter took off and it was unbelievable – felt like I was on the moon…..landscape was amazing. Now we are at 89 degrees 4.1 minutes – so we skied for 3 hours and covered only 4 miles – over typical terain. 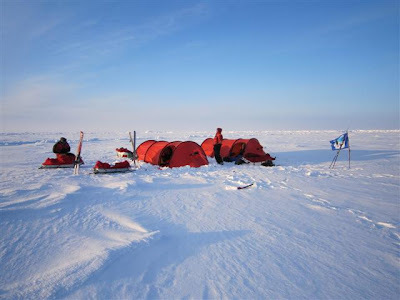 Gives you an idea what we have to do to cover 60 miles to pole, let alone drift and obstacles, open water…..wind howling as we set camp – almost lost one of the tents – now though we are inside – Keith has stove on – we have cocoa and dinner is getting fired up. Dale is so strong it is amazing. Thanks Stacey for the great Easter Candies!!!! That’s all for now – I will update temperature, longitude and latitude daily as well as some info on camp life! !